When I was a kid, I loved to play war. My friends and I would take our fake guns and pretend to shoot at each other while lobbing pinecone grenades and storming each other’s territory. Technology may have changed, but boys haven’t, and they still like to play war. I contacted Hasbro a few weeks ago with a great idea, but they just ignored me. It turns out their company has no interest in producing a Lil’ Terrorist Play Set. I think this set would be awesome. It would come with some fake guns, fake explosives, disguises, and a map to local daycare centers and synagogues. 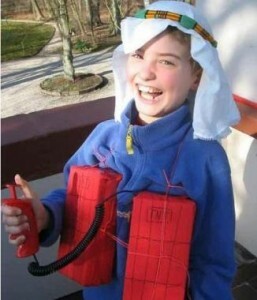 You could dress up, plant your explosives and then sit and smile smugly while waiting for Allah’s will to be done. In the event you’re more interested in confronting unbelievers in your own faith, you can get two sets. One friend could be a Sunni, you could be a Shia, and you could battle over who really gets those 72 virgins in paradise. You could also expand the line to include Mossad agent, U.S. CIA, or drunken Mike Codajoy out harassing anyone who looks vaguely Arab and/or Muslim. At the end of the day, the only limit to the fun is your imagination.